The times we live in are so troubled. People losing their jobs, the stock market falls, natural catastrophes, and uncertainty in what the future holds. In today’s economy there is little to hope for the future however God is never caught off guard or by surprise. God knows the future. You are not the only one that has felt that there is no hope. Even Bible heroes had their times when they wanted to give up. Job, Moses, Jonah, Jeremiah, even the powerful prophet in the Old Testament, Elijah. Humans have definitions of hope that are different from God’s. We might hope our team wins the Super Bowl, or we might hope we don’t lose our jobs or our house. But the biblical definition of hope is not a hope-so but a know-so. Our hope in God is surer than the sun rising in the morning. Just read these verses of hope and put yourself or your own name in the place of “I” or “we”. Where is hope found? It is in the Bible, the Word of God. Psalm 119:74 “I have put my hope in your word”, in Psalm 119:81 “… I have put my hope in your word”, and in Psalm 130:5 “… in his word (The Bible) I put my hope”. 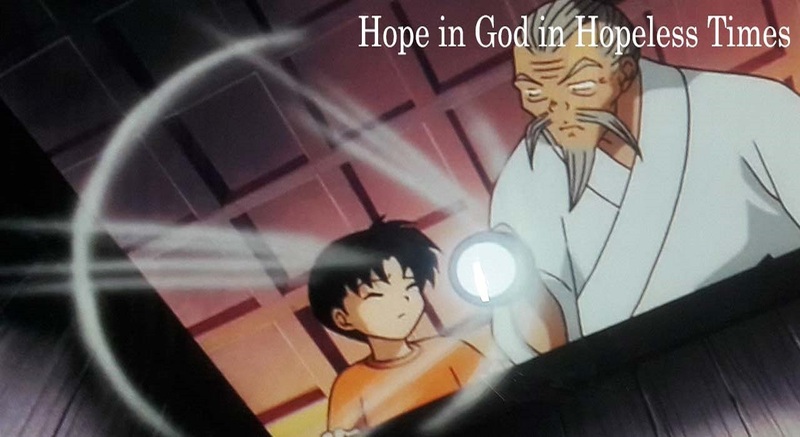 Here is real hope. When a person reads the Word of God (Bible) they can know for certain that they have a secure and certain future for God will never allow us to suffer beyond our own capabilities to handle it. There is nothing on this earth more certain than hope in God. He will never leave us nor will He ever forsake us. He is our anchor in the present and for the future. If you are a believer you can rest assured that God’s love is unfailing and He will deliver us in the days of calamity. He has rescued the born-again believers from certain judgment and promised us an eternal home with Him. Instead of using ink, God has signed this redemption with Jesus’ own blood which seals you permanently. When our hope is in the Lord and not in us, it is a rock solid hope. God had plans for you. You can bank on that. His plans are not intended to harm you but to prosper you. Now this does not mean that He plans to make you rich but He does plan for you to have a secure future. God says that He has plans for you and He knows them even if we do not. Your stockbroker or financial adviser might have plans for you too, but they do not know the future, they may try to plan for a secure future but they do not have the ability to bring it about. God knows your future and is planning it better than anyone else can, ever ourselves. Hope is for now, it is for today, and it is for tomorrow too. Jesus clearly tells Christians that He will never leave us, never forsake us, and will never, ever caste us away (John 6:37). This promise is for tomorrow morning, next week, and next year. This hope is the believer’s hope that covers their entire life. It is without end and will stay with us until Jesus comes for us. I am a father and grandfather. My children have troubles. They come to me for advice. I am always offering them hope that all things will work out for their best despite what today may seem like (Romans 8:28). I delight when they come to me with their troubles. So too does the Lord delight when we put our hope in Him and His unfailing love. He wants us to depend upon Him for everything. He delights to give us the desires of our hearts (Psalm 37:4). We are finite creatures and can not look beyond today but God has planned every step we take. He guides us and protects us, even in areas where the dark shadows of death seem imminent in the lowest valleys (Psalm 23). We might plan our own course but God Himself determines where our steps go (Proverbs 16:9). If we are not a believer, then we have only hope in this world and among men are most miserable. But if we are Christians, then we can take heart and be courageous because God is our hope. When God is your hope you have a sure thing. When it is in the world, then we are consumed with worry because we don’t know what comes next. Those who have hope in God have hope in the only One Who can guarantee our future. When we hear the words “fear in the Lord” or “those who fear him” this is not a fear of punishment or retribution. Fear is simply a reverential respect and standing in awe of God. That is what “fear of the Lord” means. It means that those who reverence God and His name have nothing to fear at all; no evil, no pestilence, no begging for bread, and no fear of want. His unfailing love is upon those that fear or revere Him: His love never fails and His eyes are fixed on you in a permanent gaze that is transfixed upon your today and your tomorrow. You are the apple of His eye (Deuteronomy 32:10, Zechariah 2:8). Our hope in God is a shied of life. Not only a shield in eternal life but in the present life. He is our help when we need it and our shield when we need protecting. God alone is our help and our shield. When we look to ourselves, our employer, our retirement fund, or our inheritance, we can not fully hope with 100% certainty. But what do we look for when our Hope is in God? We know that even our employer’s decisions are in God’s sovereign hands. Proverbs 21:1 says, “The king’s heart is like channels of water in the hand of the LORD; He turns it wherever He wishes.” The king thinks he might be in charge, or the boss might think he or she is making their own decision, but in God’s sovereignty, they do nothing that is not in God’s divine plan for us. They are subject to the Lord’s will whether they know it or not. Here the Psalmist examines his own heart in asking, Why am I so downcast? Why am I so disturbed? When really he has no reason to be because when hope is in God we have reason to praise our Savior and our God. If you do not know Christ, then I would agree that there is every good reason to be downcast, to be depressed, and to be so disturbed. The world is the most uncertain place to live in today above any other day but not so for those whose hope is in God. I have often times wrestled with tomorrow while I lay down to sleep. The many “what if’s” haunt my mind and do not allow me to sleep as I rehearse the day’s events and worry about what happens tomorrow if…. But worrying about tomorrow is borrowing trouble from tomorrow and spending it on today. When you realize that tomorrow is already taken care of by God alone and the hope you have in Him, then you can find rest. It is easier to sleep tonight if you know tomorrow is in God’s hands. Psalm 71:14 But as for me, I will always have hope; I will praise you more and more. Psalm 71:5 For you have been my hope, O Sovereign LORD, my confidence since my youth. Psalm 9:18 But the needy will not always be forgotten, nor the hope of the afflicted ever perish. Job 11:18 You will be secure, because there is hope; you will look about you and take your rest in safety. Psalm 33:18 But the eyes of the LORD are on those who fear him, on those whose hope is in his unfailing love. Psalm 33:22 May your unfailing love rest upon us, O LORD, even as we put our hope in you. Psalm 119:74 May those who fear you rejoice when they see me, for I have put my hope in your word. If you have just received Jesus, you have now received God’s inheritance rights since you are now a son or daughter of His and can never be lost again & live forever (John 10:28-29). Now, join a Bible-believing church, or call 1-888-NeedHim (633-3446) for follow up questions about salvation that is only available through Jesus Christ. Jack has written countless articles on What Christians Want To Know! Read them in the archive below. If you like what you’re reading, you can get free daily updates through the RSS feed here. Thanks for stopping by!